Simple stitches are making elegant texture. The neckline is slightly shaped to highlight your beautiful neck. 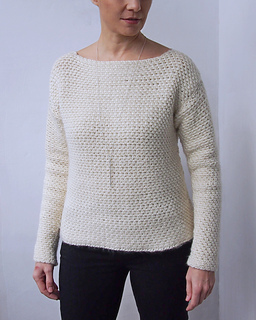 Sample is made from The MeriWool by We Are Knitters - extremely soft merino yarn with great drape in col. Natural. The yarn could be classified like DK/Light Worsted. Enjoy 20% off when buying *any 3 patterns** with coupon code 3PACK.